Hello All! 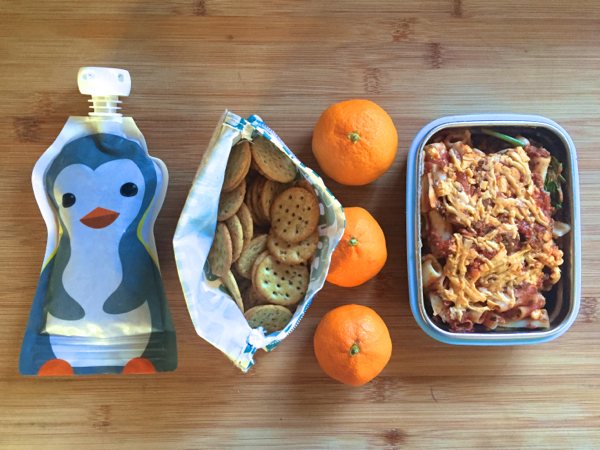 It’s time for another round of healthy, vegan, seasonal, local, and most of all – EASY – kid’s school lunches packed in reusable, sustainable, and eco-friendly containers. Because geeze, #momlife! And who knew that packing up lunches would become such a pure little pleasure for me? It may sound strange, but I truly do enjoy those quiet moments in the kitchen, late at night after Waits has gone to bed, with a podcast on and alone in my thoughts, preparing a nutritious and delicious little lunch for my weegan. It only takes me a short time, probably 10 minutes or less, and I try to use as much fresh local/seasonal food as possible (easier to do here in California, I know). 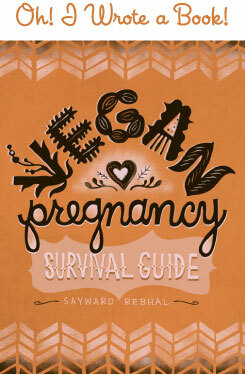 I also make sure to include a healthy dose of plant-based protein. Overall my lunches usually follow the formula: plant protein/main dish + veggie side + fruit side + and some sort of energy-dense side, like carby chips or pretzels, or fatty nuts or seeds. It’s a solid equation that seems to be working well so far, and having those loose guidelines really helps me to be able to crank out lunches on the quick, which is important for a busy working mama like myself. “Pizza bread” with tofu, marinara, cheese, and olives on whole grain bread, sent in the “Tangerine Orange” Lunch Skins full-size sandwich bag. A simple salad of shredded romaine and kalamata olives, with an olive oil dressing, sent int he largest of the Kids Konserve stainless steel nesting trio. Carrot sticks and cuties, both from our local organic CSA box, sent in the middle-sized Kids Konserve stainless steel nesting trio. Cinnamon-covered almonds sent in the smallest of the Kids Konserve stainless steel nesting trio. I’m sure I sent him a beverage of some sort, but it’s not pictured. Oops! A peanut butter, strawberry, and kale smoothie in our adorable Penguin Squooshi reusable squeeze pouch. True story: I am in LOVE with these pouches! Whole wheat crackers in the half-size “Aqua Elephant” Lunch Skins reusable baggie. Three local organic tangerines from our CSA box. Leftover pasta bake (rice noodles, marinara, spinach, beyond meat crumbles, and vegan cheese on top) in the Steeltainer compact container. Cinnamon almonds in an inherited plastic mini container (brand unknown). Snap peas from our local organic CSA, washed and trimmed and sent in the smallest Kids Konserve stainless steel nesting trio. 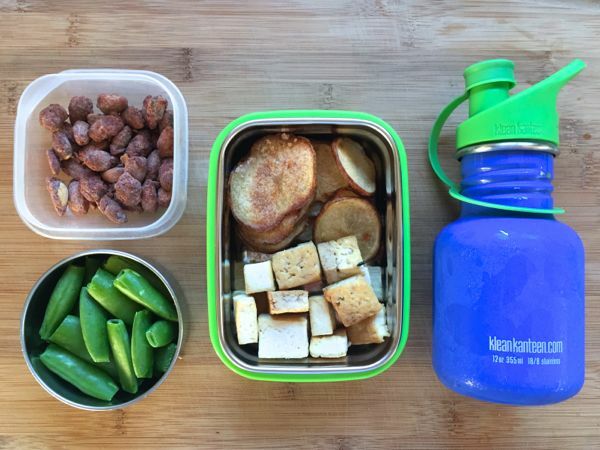 Leftover baked tofu cubes and oven-baked potato “chips”, in the Thinkbaby bento. Oat milk in the pretty blue Klean Kanteen 12-ounce stainless steel sport top. Organic “corn puffs” (Waits begged me for these and I caved. They tasted pretty meh and I won’t buy them again) in the large “Tangerine Orange” Lunch Skins full-size sandwich bag. The inimitable Magic Beans, in the large-sized Kids Konserve stainless steel nesting trio. 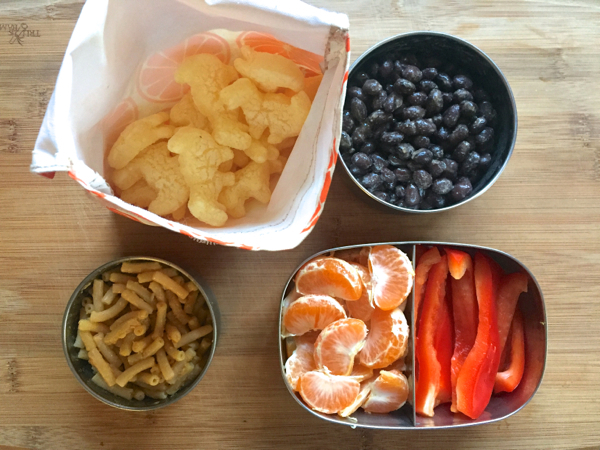 Organic tangerines and red bell peppers in the Lunchbots Duo divided steel container. Leftover homemade mac ‘n “cheese” in the small-sized Kids Konserve stainless steel nesting trio (you can see I get a lot of use out of this trio!). I’m sure I sent a drink, but again – unpictured. Leftover pizza (yes, we do a lot of leftovers! 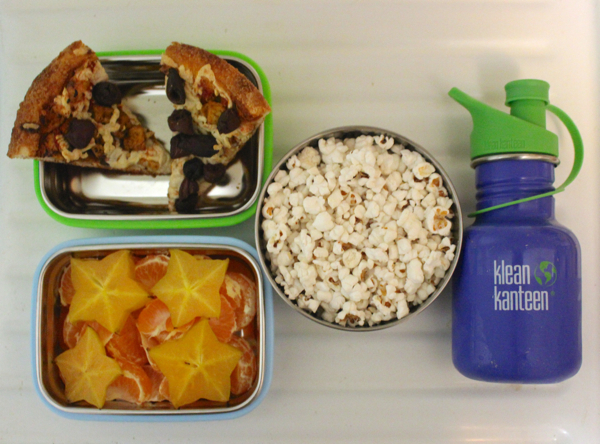 sometimes I specifically make extra dinner so I’ll have some to send in lunch the next day) in the Thinkbaby bento. More tangerines (like I said – California winter) as well as star fruit, in the Steeltainer compact container. Olive Oil popcorn in the large Kids Konserve stainless steel nesting trio. Oat milk in the Klean Kanteen 12-ounce stainless steel sport top. Peach smoothie with protein powder and spinach, probiotics and vitamins, in the Panda Squooshi reusable squeeze pouch. 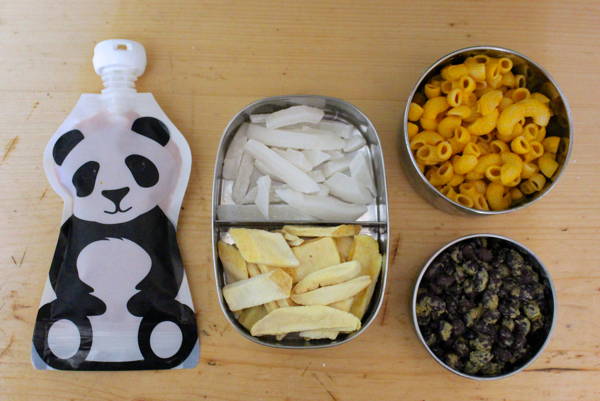 Dried coconut strips and dehydrated mango in the Lunchbots Duo two-compartment container. Boxed mac ‘n cheese (don’t hate the player, just hate the game) in the medium Kids Konserve stainless steel nesting trio. Magic Beans in the smallest Kids Konserve stainless steel nesting trio. And there you have it — another round of healthy, seasonal, plant-powered and eco-friendly lunches. Winter is finally over, spring has sprung, and just this week we received the very first strawberries of the season in our CSA box! Waits was pretty stoked, and I’m also looking forward to the coming bounty of fresh fruits and vegetables. Viva la spring! what a cool post. 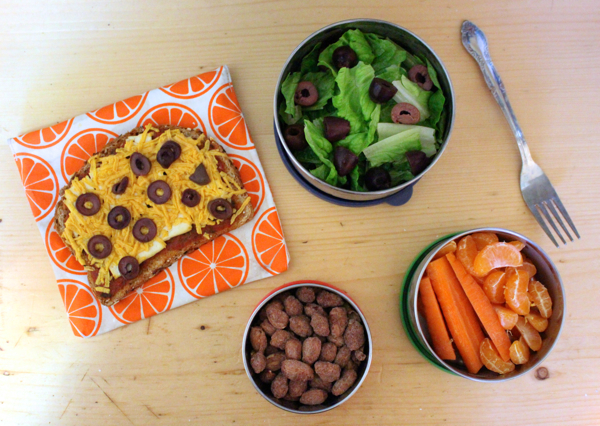 packing a lunch that is appetizing and relatively easy and healthy seems like such a huge task in parenting. It looks like you do such a great job, and I love that you are so committed to a zero/low waste approach to packed lunches. Good for you! I almost always get to eat lunch at home, and I also almost always eat leftovers from the night before. I know all about making extra dinner just to have leftovers. That’s the only way to go! I forgot about your Magic Beans recipe! These lunches look so well balanced, I should be applying this method to my own meals. The tin containers are great too, in theory I like glass but it’s so heavy. Thank you for posting where you got these items! I do have a question (and I know it somewhat depends on the child), but does/has Mr Weegan lost his lunch things? Not necessarily the metal portions, but the pouches, or reusable zippered lunch skins? I really need to get some of those reusable baggies for my own work lunches! I used to be good about at least washing and reusing plastic baggies. But here lately, I’ve become a lazy failure at that. I need to be better! This makes me look forward to being able to pack my lunches again! Delicious!